Matt is from the Northeast U.S. and lives there throughout most of the year with his wife and son. Although he is passionate about the rock and ice climbing terrain in his home mountains, the Adirondacks of upstate New York, he can’t resist the diverse landscape and climbing opportunities that the rest of the country has to offer. For the better part of 20 years Matt has travelled seeking out long alpine routes, sunny desert rock climbs and perfect powder stashes with his climbing partners, whom he considers to be some of the finest people on this planet. 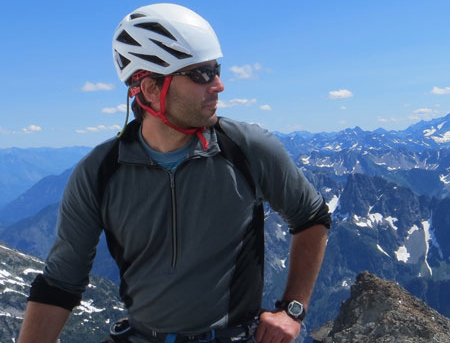 Matt now spends his summers in the Pacific Northwest where he shares his stoke for mountaineering with his guests on Mt. Rainier and in the North Cascades. When he’s not climbing or guiding, Matt enjoys paddling quiet waters to remote campsites, cooking seasonal food and hanging out with friends and family. In between traveling for climbing and guiding objectives, Matt spends most of the winter as a ski patroller at Whiteface Mountain and guiding ice climbing in the Northeast. Classic traditional rock and ice routes in the Northeast U.S.